When I was growing up, my family always seemed to have some form of an Eggo in the freezer. It's a childhood breakfast staple that many of us look back on with fond memories. However, these days Eggo seems to be in new product overdrive. They're always rolling out another creation with the hope that something will stick. I generally shrug these products off as just passing fads, but when I saw Eggo's latest offering in the freezer case, I just couldn't resist giving them a try. Eggo Strawberry Bake Shop Swirlz are basically Eggo's answer to Pillsbury's Toaster Strudels. When I opened the box, I was actually pleasantly surprised by the size them. The pastries weren't as large as the picture on the box would have you believe, but they're still fairly substantial and will fill up those who like to eat light in the morning. As I took my first bite, I noticed the taste of the crust is quite similar to that of a regular strawberry Eggo waffle. Little strawberry bits are sprinkled throughout the pastry. This provided more of a muffin taste that I appreciated as a change from all the flaky crust products on the market. The taste of the strawberry filling in the Bake Shop Swirlz is pretty enjoyable. It has a nice jam-like consistency that isn't overly sweet. However, I was slightly disappointed at the small amount of icing that was present in the pastries. The icing runs together with the strawberry filling much of the time, so I didn't really even notice it in some bites. In the bites where I was able to taste it, I was quite impressed with its flavor. It's almost like a thin powdered sugar glaze that provides an extra hint of milky sweetness without being overpowering. Overall, I liked Eggo Strawberry Bake Shop Swirlz. While they were nothing mind-blowing in the world of breakfast products, they were definitely a satisfying morning treat and a nice change of pace. Somehow eating one of these seems a little more special than just having another Pop-Tart or cereal bar. While there could have been a bit more icing inside, I really liked the fact that the mellow flavors worked well together and weren't excessively sweet. I finished off the box thinking that they were fun to try, but I probably wouldn't buy them again. 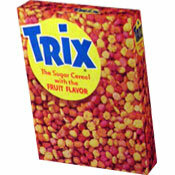 However, a few days later I found myself wanting another box as I cruised by them with my shopping cart. I originally planned to give them a 5 golden egg rating, but I figured I'd bump them up one more since it looks like they may have some staying power in my freezer. Eggo Cinnamon Bake Shop Swirlz are also available. First... I want to send out a huge thanks to Heather for sending this review. Awesome review Heather! You're a breakfast angel for sending it. I also had a chance to try this product and I agree, for the most part, with Heather. I probably would have given Eggo Bake Shop Swirlz (Strawberry) one less golden egg just because it's missing razzle-dazzle or pizzazz. It's a very pleasant product. The crust has nice texture that feels like a cross between a pancake and French toast. The filling delivers on the creamy strawberry taste you'd expect from the box. I enjoyed them, but like Heather's first impression, I had no desire to run out and get some more. I'd love to see this product come with a package of icing to drizzle over the top... something to add a hint of magic. This product has a better nutritional profile than Pillsbury Toaster Strudels. Toaster Strudels are pretty bad fat offenders with 9 grams of total fat - one of which is Trans fat. This product has no Trans fat and only 3 grams total fat. One last note... be sure to follow the directions and toast these pastries twice on a medium setting. Otherwise, the filling will be cold. Thanks again for the great review Heather. Please send more reviews anytime you want! What do you think of Eggo BakeShop Swirlz - Strawberry? The best pastry I ever had. If you haven't tried it, your taste buds are missing out a lot. Make it come back out! I need it now! LOL. Seriously! My son and my me love this product and would like to find out where they sell Bake Shop Swirls. Please you and very much. Signed me. Strawberry Swirlz are great. We have no where to buy them. Every since the Listeria scare, we have been unable to find them. Will they ever make anymore? For Joannie: Kellogg's has a product locator page where you can enter your zip code and search for a product, including their Eggo items. Good luck! Where can I find this product? The eggo bake shop swirlz? I want to try them because my neighbor says they are so good, but neither she or I can find them. 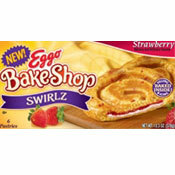 I want my Eggo BakeShop Swirlaz the Strawberry ones. I find that Eggo Swirlz Cinnamon were very sweet the fillin', but it was okay, you need too cut down on the SWEET FILLIN'. I like Eggo BakeShop. Thanks to Kelloggs. I like Eggo. Thank you. The best food. I thought Eggo BakeShop Swirlz - Strawberry tasted like a stuff waffle. There isn't enough filling, the ratio of bread to filling is terrible. I probably would have rated this better if I never had the pillsbury toaster strudel, which eggo claims there product is better than. If you want to try this product do so before purchasing or tasting pillsbury toaster strudel or you will be dissappointed.